ICRI Buyer's Guide Information - International Concrete Repair Institute, Inc. 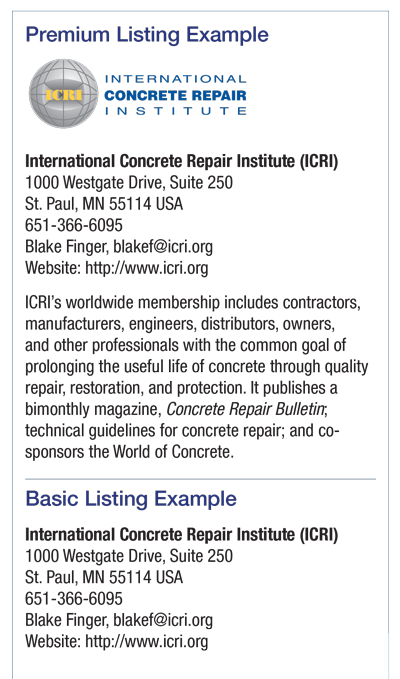 The International Concrete Repair Institute (ICRI) is pleased to offer a Buyer’s Guide that focuses on sharing the contact information of vendors and companies associated with ICRI. The Buyer’s Guide will be available electronically as a static webpage for the calendar year on the ICRI website. All current ICRI Supporting Members will automatically receive a complimentary Basic Listing in the Buyers Guide. Basic listings can be upgraded to a premium listing for increased visibility, including your company logo and description (up to 50 words). Enhancing your listing will better draw attention to your organization. Download the ICRI Website Advertising Brochure. Visit the ICRI Buyer's Guide. Questions? Contact Blake Finger at blakef@icri.org or (651) 288-3423.